WRENTHAM, Mass. 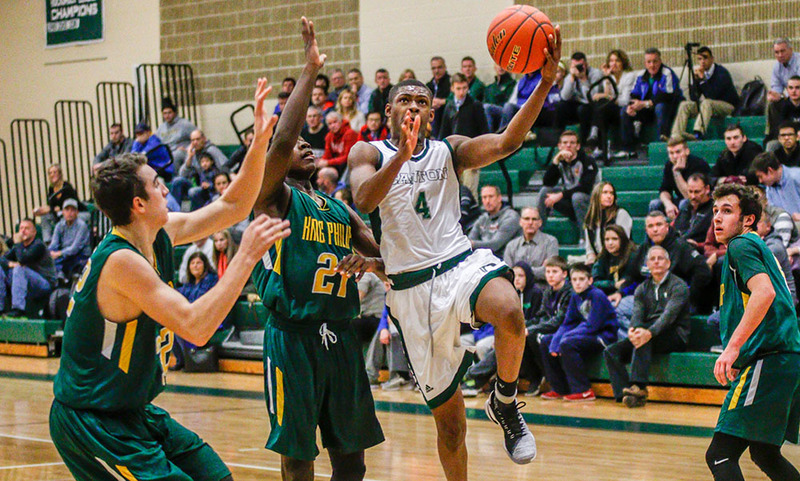 – Franklin got off to a strong start on Friday night and that momentum carried the Panthers to a 72-59 road win over King Philip. 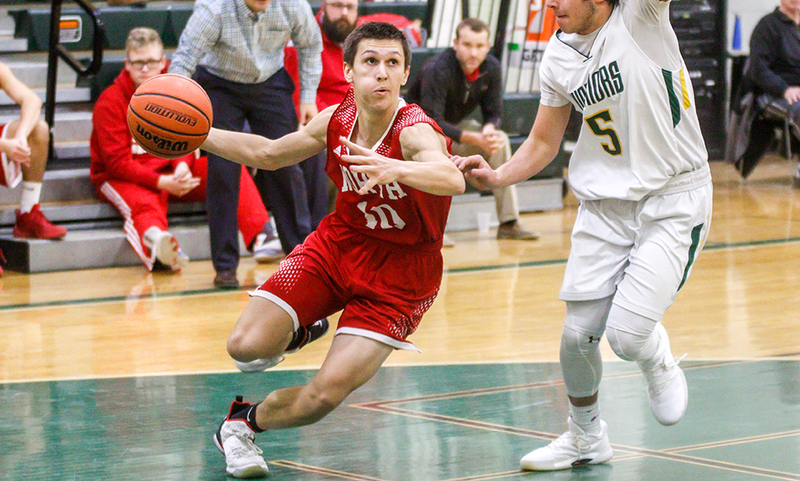 The Warriors kept things close in the opening quarter, with Tom Madden cutting the deficit to four (11-7) but Franklin responded with a run to stretch its lead. The Panthers rattled off a 9-0 run that included a Connor Goldstein three pointer and for points from Paul Mahon, who had five of his 13 points in the first quarter. The run gave Franklin a 20-7 lead after eight minutes. With Franklin big man Connor Peterson (18 points, five rebounds) on the bench to start the second quarter due to foul trouble, KP quickly put four points on the board, but Franklin quickly answered back with four of their own. 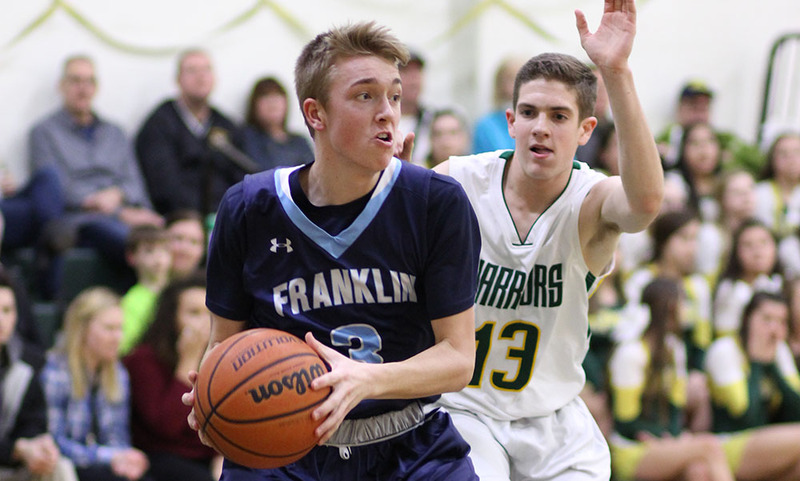 A huge quarter from Josh Macchi, who scored 10 of his 13 points in the second period, had Franklin up 36-25 heading into the second half. The key in the first half for Franklin was the production from the bigs in Macchi and Peterson (seven first quarter points). “They switched on a lot of screens…they switched on everything just like they did last time, [a 64-49 Franklin win] and we came in knowing that if they were going to continue to switch the little guys and the big guys, that we just had to continue to pound away at it and get in there,” Franklin coach CJ Neely said after the game on the performances from his bigs. In the third quarter, both teams came alive from beyond the arc and seemed to trade threes on every possession. After a layup to open the frame, the teams combined for four straight threes, including two in a row from Franklin freshman Chris Edgehill, who added two more threes for 12 of his 18 points in the third quarter. “Chris has really progressed throughout the year, he’s a freshman obviously, he’s been playing point guard a pretty high level, leading the team, he’s advanced and him hitting those shots and spacing the floor after they started collapsing on the big guys, he got some open stuff and was knocking it down,” Neely said. King Philip junior Justin Vine (four rebounds) emerged as a problem for the Panthers in the third quarter. Vine scored all eight of his points in that frame, including two threes, to keep the Warriors within striking distance. Franklin took a 55-42 lead into the fourth, but a 6-0 KP run — started by a three from Kyle Layman (13 points, six rebounds) — cut the Franklin lead to just seven at 55-48. After Franklin looked to pull away again following two free throws from Edgehill and a layup from Peterson, but KP’s Seth Sullivan (12 points) hit one of his four threes on the night to bring the lead back down to eight. After Peterson responded with another layup of his own, Pharoah Davis (12 points, three rebounds) finished on a fast break down the other end, but Franklin was clutch at the free throw line down the stretch, going 7-8 from the line in the fourth quarter to seal the 72-59 win. Next week, both teams will participate in tournaments over February break. 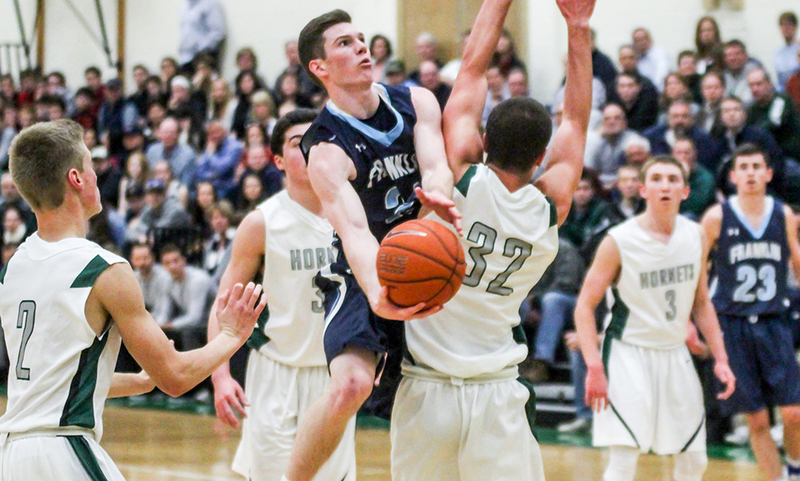 Franklin (16-4, 14-2) begins play Monday at noon at Franklin High School against Cardinal Spellman. King Philip (6-13, 5-11) will head to Somerset Berkley on Monday at 6:30 PM to take on the Raiders. NORTH ATTLEBORO, Mass. 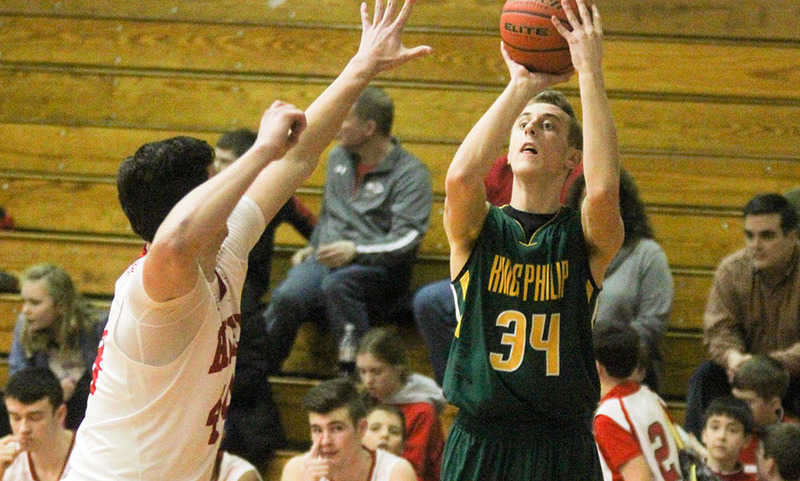 – Already having matched its win total from a year ago, King Philip came out determined to surpass it on Tuesday night. On the back of a near flawless first half that included impressive defensive showing, the Warriors raced out to a 25 point lead by halftime and never looked back in a 71-52 win over the Rocketeers. Starting with a three from sophomore Kyle Latman (12 points, 10 rebounds, six assists, three blocks), the Warriors were off and running in the first quarter. While the offense shot nearly 50% from the field— including a three Justin Vine (eight points) — the defense was equally impressive, forcing five turnovers. 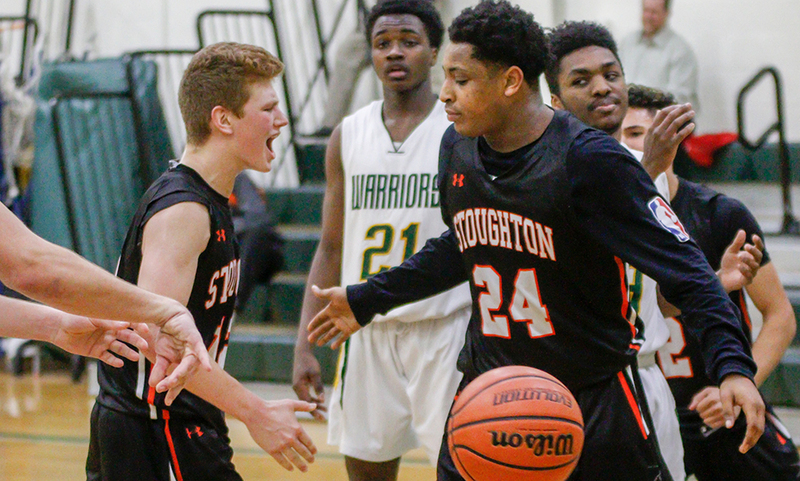 The Warriors defense also limited North Attleboro to just two field goals in the opening eight minutes – both threes from Hacmoni Cuevas. The Rocketeers were 0/6 from inside the arch though and KP led 18-8 after a quarter. King Philip’s defense only got better in the second quarter, and so did its offense. The Warriors rattled off a 13-2 run over the first four minutes of the second period. Tom Madden (seven points) made back to back baskets and Layman converted a putback for a quick 6-0 spurt. After Chad Peterson knocked down a midrange jumper for North, Layman took a feed from Madden for two, Vine drove to the basket for two and Seth Sullivan (21 points) drained a three to put an exclamation point on the run. King Philip led 39-14 at halftime, shooting 47% from the field. The Warriors limited North Attleboro to just 18% shooting in the first half. Two keys to King Philip’s strong start came on the defensive end. The Warriors limited North big man Jonny Friberg – who entered the game as the fifth leading scorer in the league – to just four points. KP also put a lot of focus on Brent Doherty (14.3 points per game) by extending their defense full court with Pharoah Davis (12 points) shadowing his every move. And part of the key to success on offense? North rolled out full court pressure in the second half to jump start the offense, and it worked. The Rocketeers forced five turnovers and scored 15 points – more than its total in the first half – but KP kept pace with 16 points of its own in the third quarter. The pressure continued to pay off in the final quarter as the Rocketeers forced seven turnovers, doubling the amount they had forced through the first three periods. Friberg scored 12 of his 16 points in the second half and hauled in nine rebounds. Thomas Reynolds added five points and Matt Seavey chipped in with four in the fourth. North Attleboro scored 38 points on 45% shooting in the second half, cutting the deficit to 20. But the early hole was too much. 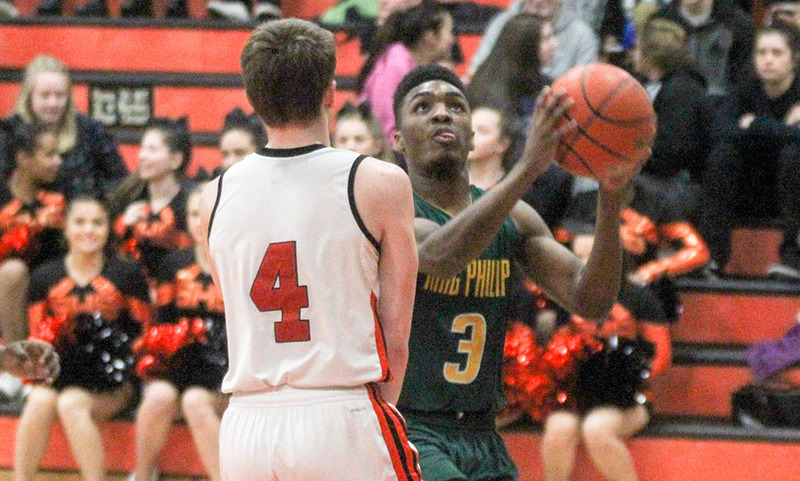 The win marks King Philip’s third straight, turning a 3-8 mark to 6-8 overall as the Warriors prepare to go through the Kelley-Rex schedule for a second time. The first time through, KP posted a 1-4 record. The Warriors (6-8, 5-6 Hockomock) begin their Kelley-Rex schedule on Friday when Attleboro comes to town. North Attleboro (8-7, 5-6) will try to snap its three game skid when Canton comes to town the same night.